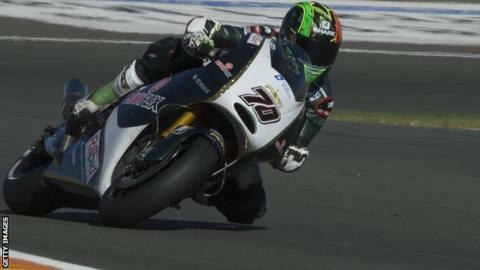 Michael Laverty is still seeking his first points in this season's MotoGP after finishing 16th at Jerez in Spain. The Paul Bird Motorsport rider from Toomebridge has come in 16th, and one place outside the points, three times from four races in 2014. His PBM team-mate Broc Parkes was one position further back in 17th. World champion Marc Marquez made it four wins out of four with Yahama's Valentino Rossi in second and Honda team-mate Dani Pedrosa in third. The victory, in his 100th grand prix, saw the 21-year-old Spaniard become the first man to win the opening four premier-class races of the year since Mick Doohan in 1992. Bradley Smith was eighth, while fellow Briton Cal Crutchlow retired. Marquez had no such problems, building a four-second lead by lap 12 and cruising home to delight a crowd in excess of 15,000. He said: "It's a special victory because I had never won here before. "I was expecting more of a bunched-up race but I saw that I started with a good rhythm and I was feeling in good shape." Laverty finished just over 11 seconds behind Hector Barbera in 15th.